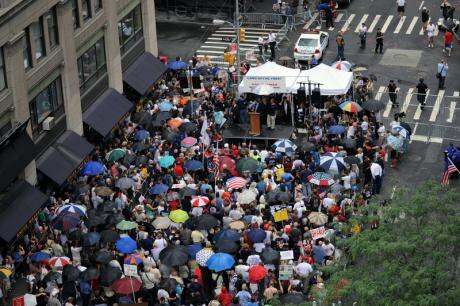 Ground zero mosque protest,2010. Demotix/CSMUncy. All rights reserved. Despite a wealth of empirical evidence, from overlapping board memberships among think tanks, to examples of Islamophobic tropes in pro-Israel propaganda, little scholarly attention has been paid to the overlap between Islamophobia and Zionism. This article focuses on some of the convergences in the funding networks of organised anti-Islam and pro-Israel groups, and it does so because it is important to locate the material base for the circulation of ideas in society in order to understand whose interests are being served. This funding nexus has been under-examined partly because of the problems of data collection where non-transparent think tanks are concerned, but also due to the highly politicised nature of the issue. Though the roots of Islamophobia are transnational and centuries old, it is possible to identify and even quantify contemporary efforts to keep it alive. In 2011, the Center for American Progress (CAP) produced a report, which examined the so-called ‘misinformation experts’ (as well as the politicians and media outlets) propagating Islamophobic ideas in the public sphere. While millions of Americans were being reached – and perhaps influenced – by these ideas, behind them was ‘a small, tightly networked group’ sustained by ‘funding from a clutch of key foundations’ pumping large amounts of money into the network. The data CAP compiled traced donations from the seven most significant donors to the eight most significant recipient bodies. The activities of each organisation are detailed in the CAP report and will not be repeated here, save for one indicative example – the Donors Capital Fund gave a single block grant of $18 million to the Clarion Fund in 2008, the same year the group distributed 28 million copies of the Islamophobic film Obsession, while Barack Obama was running for president and conspiracy theories about him being a ‘secret Muslim’ abounded. In total, these seven foundations and charitable trusts put $42.5 million into the promotion of Islamophobia during the period studied (2001 to 2009). It is also worth noting the complexity of the money flows. For example, Robert Spencer’s Jihad Watch received money not only from Aubrey and Joyce Chernick’s Fairbrook Foundation, but also from some of the other major recipients, including the David Horowitz Freedom Center. The CAP report notes the Zionist connections of many of the personnel involved in the Islamophobia industry and Israel crops up frequently among other causes receiving donations from these foundations, but CAP did not explore this very obvious intersection. However, the link has been examined by Elly Bulkin and Donna Nevel, who went back to the IRS 990 forms of the same seven foundations and collected the data on the Israel-related donations they had made. The total amount given by the same seven major Islamophobia industry donors to Israel-related causes is nearly $11 million. The figures demonstrate an undeniable overlap in the giving patterns of at least four out of seven of the foundations, which as well as funding Islamophobia, gave indisputably significant amounts to Zionist projects during roughly the same period: The Anchorage Foundation & William Rosenwald Family Fund gave around $1.1 million; Fairbrook Foundation gave almost $1.8 million; Newton & Rochelle Becker Foundations & Charitable Trust gave just under $2.4 million; and the Russell Berrie Foundation gave $4.6 million. However it is also important to note that the overlap is by no means absolute or comprehensive: Donors Capital Fund gave just under $1 million, which compared to the $20 million donations it channelled to the Islamophobia industry is relatively small; Lynde and Harry Bradley foundation gave only $70,000 to Israel-related projects; while the Richard Mellon Scaife foundations are not known to have given to any Israel-related projects. a conspiracy theory which originates with Islamist groups, but is no longer limited to those circles. It refuses to acknowledge the legitimacy of any concerns about political Islamism, which it conflates with Islam and Muslims in general. It has nothing to do with fighting Islamophobia, but repeatedly shouts down any other voices in that debate. If we can accept that there are times when the label ‘antisemitism’ is misused to shield Israel/Zionism from criticism, we should also accept that there are times when the label ‘Islamophobia’ is misused to shield Islamists/ism from criticism. Equally, however, if we agree with Rich’s assertion in the same article, that ‘the promotion of antisemitic ideas by Islamist groups’ is to some extent a genuine phenomenon of legitimate concern, we must also accept as legitimate – rather than dismissing as ‘conspiracy theory’ – concerns raised about Islamophobic ideas being promoted by some Zionist groups. It is true that the overlap between Zionism and Islamophobia seems to be much stronger in the USA (though it may be a growing trend in the UK, perhaps best exemplified by the neoconservative British think tank the Henry Jackson Society, which has received donations from the USA). It is also important to acknowledge clearly that the studies referred to above present data extracted according to specific preconceived areas of interest and exclude donations related to many other causes. It would no doubt have been possible to manipulate the figures to show some degree of overlap between, say, anti-Muslim donations and educational projects; or Israel-related donations and funding to the arts. However, these figures do not stand alone. Complementing them is a wealth of qualitative data, some of which I will outline now, which suggests that there is a meaningful link between Zionism and Islamophobia together with some rational explanations for the convergence. It is nevertheless worth saying that it certainly would be an antisemitic conspiracy theory to claim that the data shows that ‘Jews’ are promoting Islamophobia. Indeed this would be a case of opposition to Islamophobia taking the form of antisemitism – the reverse of cases in which ‘opposition to antisemitism takes the form of Islamophobia’. Many, if not most, of the key actors in both pro-Israel lobbying and the Islamophobia industry – for example Christian Zionists and the many ‘native informant’ Muslims involved – are not Jewish; these are political issues rather than issues determined by ethno-religious identities. To say, then, that Zionism is not synonymous with Islamophobia is not to ignore the fact that political strands of Zionism (though not cultural forms) involve processes of racialisation and to some extent advocate a racial hierarchy – albeit in a specific geographical context; nor the historical fact that, as ‘a nationalist ideology, and simultaneously a conservative ideological response to European antisemitism, modern Zionism developed in close association with colonialism and imperialist expansion’. Put into practice, and embodied in the state of Israel, Zionism has been characterised by decades of occupation, settler colonialism and the ethnic cleansing of indigenous people. In addition, due to the necessary preoccupation of Zionism with demography, discrimination against non-Jews living with the 1948 borders of Israel continues. Therefore, in the context of Palestine/Israel it seems that Zionism is de facto and inter alia Islamophobic. But to equate Zionism and Islamophobia too closely would be to erase the equally clear dispossession of Palestinian Christians. It would also ignore the fact that Zionism is a form of ethnic nationalism which in the land of historic Palestine not only privileges Jews over Muslims (as well as Christians, Arabs and others), but also overlaps with other forms of racism that can operate even against certain groups of Jews. For example Ashkenazi Jews are over-represented in the elite strata of Israeli society compared to, for example, Sephardi Jews. At the same time, representation of Mizrachi Jews in ultra-nationalist forms of Zionism currently dominant in Israel is on the rise. Racist discrimination faced by Jews of East African origin, however, has been consistent. To return to Rich’s critique, outside of the context of Palestine/Israel (for example, in the USA and the UK) it is, at least in theory, correct to say that ‘there is no reason why someone cannot support Israel in the Middle East and also oppose hate crimes against Muslims in Britain’ and that it should not be ‘taken for granted that somebody who is a “Zionist” is ipso facto anti-Muslim’. This was borne out by the funding data cited earlier, which showed that at least one major foundation promoting anti-Muslim hatred appeared to have no links to Israel and two had only minimal connections. Further research could be done to analyse the funding overlap in the opposite direction, in other words starting with Zionist groups and looking at which donors also gave to Islamophobia promotion. However, it is clear that though there might be significant overlap, especially in the USA, it is far from absolute. Furthermore, just as Rich makes clear his opposition to Islamophobia, there are examples – such as Peter Beinart in the USA – of liberal Zionists being involved in anti-Islamophobia campaigns. It is not within the scope of this article to assess whether such initiatives could gain momentum, but given recent pronouncements about ‘the end of liberal Zionism’ and the ‘triumph of neo-Zionism’, it seems likely that the space for an anti-racist Zionism – if indeed such an idea was not a paradox all along – is fast diminishing. It is not because they are instinctive bigots. It is that they believe that the more acceptance there is of Muslims here at home, the less reflexive hatred there will be for Muslims abroad. And that, in their view, reduces America’s sympathy for Israel. I don’t like to say this or put it this way but I think most Americans see Arabs as backward, primitive, savages, terrorists and... so every time there’s a terrorist attack, it just reinforces what most Americans believe. So if you look at those same polls there’s virtually no support for the Palestinians. While Bard is not referring to the domestic context and is certainly not saying that AIPAC deliberately promotes anti-Muslim or anti-Arab stereotypes, he is clearly making a causal connection between the fact that such stereotypes are pervasive and the fact that few Americans sympathise with the Palestinian cause. The risk here is that, if one accepts this analysis, from an Israel-advocate’s perspective it arguably makes sense to perpetuate these ideas, or at the very least not to challenge them. Thus, while Rich may be correct in theory that one can support Israel in the Middle East and also oppose hate crimes at home, Rosenberg’s account of how the views of people like Bard regarding foreign affairs may end up being applied at home is compelling and problematises Rich’s assertion. In practice, we can see this phenomenon play out on both sides of the Atlantic. The extent to which pro-Israel lobby groups have cultivated such an atmosphere [of Islamophobia] has reflected their anxiety that the Muslim-American population is growing, and that the political influence of Muslims in the US might one day reflect their numbers. This fear – that acceptance of Muslim participation in democratic processes could influence domestic government policy on, as well as public attitudes about, the Middle East – has been articulated by Alan Mendoza, director of the UK’s Henry Jackson Society, with regard to the European context. When he spoke at the AIPAC conference in Washington, in June 2013, about waning support for Israel on the continent, he pointedly noted that: ‘The European Muslim population has doubled in the past 30 years and is predicted to double again by 2040.’ Therefore, the so-called ‘demographic threat’ commonly discussed in Israel with regard to Palestinians (referred to as ‘Israeli-Arabs’), is transposed to the USA and to Europe. Support for ethnic privilege in one geographical region bleeds into anxiety about the political influence of Muslims (assumed to be homogenous and monolithic) as an ethno-religious group in other contexts. At its most extreme, this demographic argument comes in the shape of the infamous ‘Eurabia’ conspiracy theory, promulgated by Bat Ye’or, a paranoid Islamophobic fantasy about an elite bargain to transform Europe into an Islamic continent, which gained traction after 9/11 and is popular with the far-right ‘counterjihad’ movement. If the ‘war on terror’ has stimulated the growth of Islamophobia, it has also accelerated the opportunistic positioning of Israel as the ‘front-line’ of the ‘war on terror’ by Israeli politicians and Israel-advocates. While these trends were under way well before 9/11, further research is needed into what appears to be a rapidly growing connection, which can probably best be explained by historical contingency. While Islamophobia is fast becoming ‘the defining condition of the new Europe’ and is flourishing in the west more broadly, Israel is increasingly being constructed as defending ‘the Judeo-Christian’ heritage in a clash of civilisations with ‘radical Islam’. However, as we have seen, some promoters of Islamophobia have little or no interest in Israel and to argue that Zionism is the only or even the main cause of anti-Muslim bigotry would be inaccurate and unhelpful, ignoring many other sources of anti-Muslim prejudice, not least misguided counter-terrorism policies in many western nation states. Islamophobia is much older than the state of Israel and much older than Zionist ideology. In addition, even where an overlap is evident, the instrumentalisation may function in the opposite direction, in the sense that Islamophobes who fear what they perceive as Islamic expansionism (‘Islamisation’ or ‘Islamification’) view Israel as a critical bulwark. The overlap between Zionism and Islamophobia is, then, far from absolute and there is no straightforward causal relationship, but it has been argued here that a considerable faction of right-wing Zionists, of the sort who have long dominated pro-Israel politics, are often linked to organised Islamophobia promotion. Though this is not seen as inevitable, the ‘ethnicization of politics’ flows smoothly from the ethnocentric particularism of Zionist ideology. It is suggested by way of a conclusion that, in the context of growing racism of all forms, any attempt to build a much-needed transversal anti-racist political movement needs to be de-linked from Zionist political imperatives which could preclude its success.